I think I've died and gone to fashion heaven. 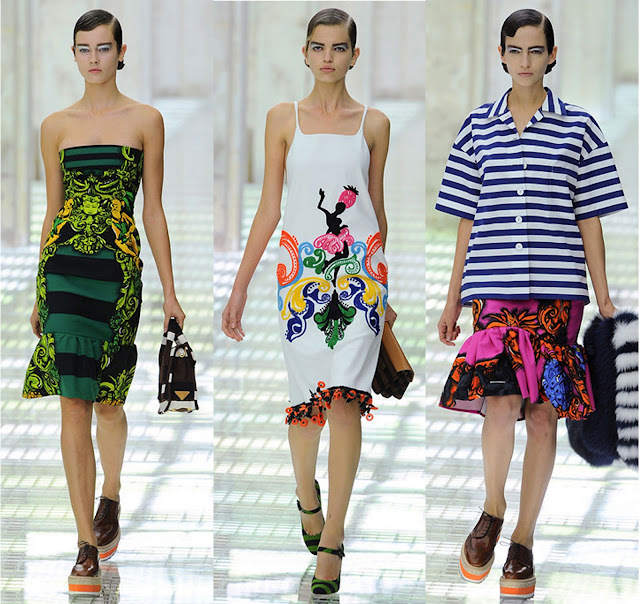 In a million years, I would never have put Prada on my list of top five favorite designers, but this Spring it's by far my number one! I am so obsessed with the crazy colors and furry materials, bold stripes, and wacky florals I honestly don't know what to do with myself. 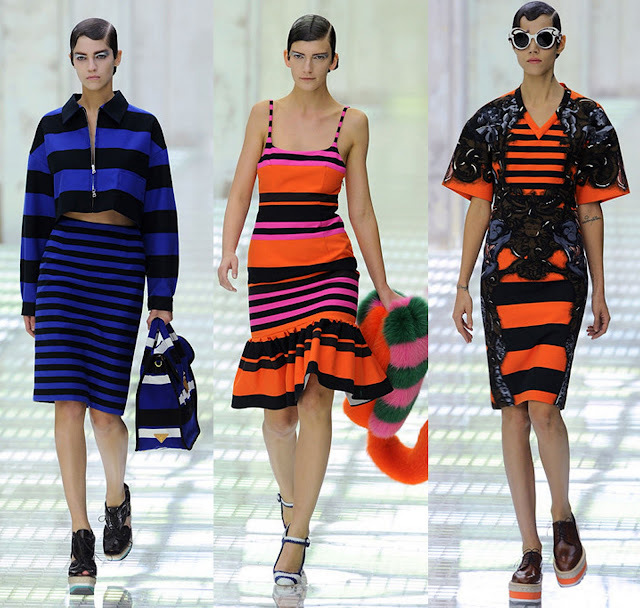 I have looked and re-looked at the Spring 2011 runway show more than fifty times so far and oogled helplessly over the technicolor platforms to the point of desperation. I NEEEEED THEM NOW! 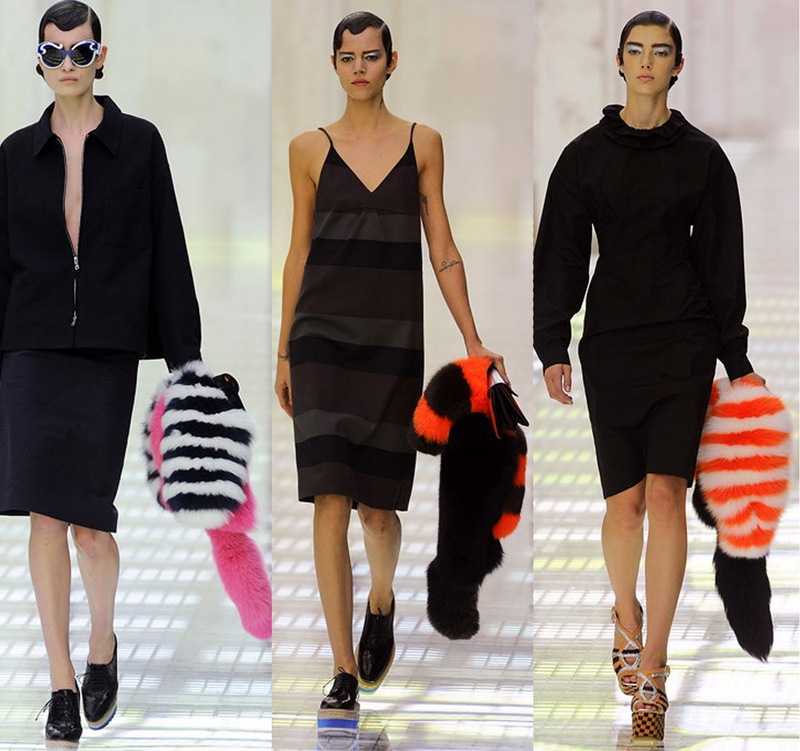 I couldn't help but get a feeling that the inspiration for this fantastical collection came from something bizarre and cooky, akin possibly to a Tim Burton movie or a foreign cartoon. And that's when it hit me...this entire collection looks like it's been pulled straight from a movie board for Alice and Wonderland. I went through the RTW and the accessories over and over and realized I could place characters from the movie throughout the entire collection! This realization only made me more obsessed (as AIW is one of my favorite all time classics,) so I decided to do a "reverse" mood board. Typically one puts together an inspiration or mood board of images that would inspire the design of the collection. I am doing the opposite. 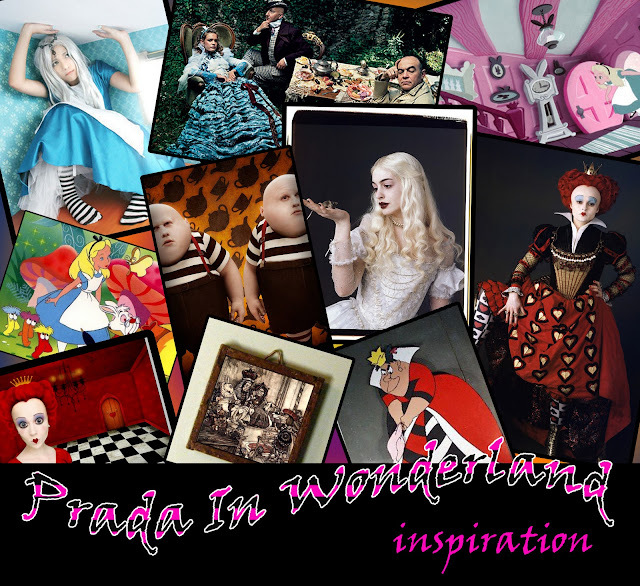 My mood board is inspired by the collection...an imaginative collage of what Miuccia Prada might have been inspired by when creating this eye-popping collection. Here is my inspiration board, followed by some of the Prada Spring 2011 RTW collection (labeled as characters from Alice in Wonderland,) the footwear as it appeared on runway, and finally some of the incredible designs that actually made it to retail! I. CAN. NOT. WAIT! Hope you enjoy! JUST FOR YOU AND ME! THANK YOU NEIMAN MARCUS. I HEART YOU. COLORS, COLORS, EVERYWHERE! YESSSS PLEASSSEEEE!!!! !